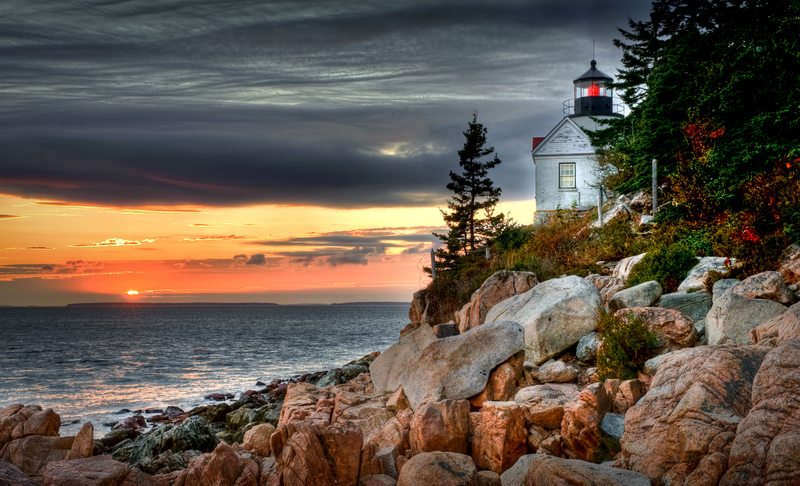 One of my first blog posts was an HDR photo of the Bass Harbor Lighthouse at sunset. Now that I have learned more, read more, seen more, I’ve come to cringe a little over that early, over-the-top saturated version. This time I went back and started from the original bracketed exposures and gave it another go, trying to achieve something more realistic. I’ve toned down the saturation, and eliminated most of the halos. Bass Harbor Lighthouse is just a great location, even if you end up shooting the same shot 1,000 other photographers have gotten. Like I did. At least the sky is different every sunset! Here’s that earlier version for comparison. A couple of weeks ago I posted an HDR image of Lower Baker Pond, New Hampshire that got a good response. I went back into my original files and found another bracketed set of exposures I took during that brief stop, looking in another direction. This time I attempted to process the HDR with less of a surreal look, aiming for something resembling what might be the result of using a neutral density graduated filter during the actual shot. I find it pleasing. The composition may lack that extra 5% to make it great, but the sky, mirror smooth water, and eye popping foliage was an irresistible combination. It’s sort of like trophy hunting I suppose. I sought out this specific farm in Vermont. Even if you don’t specifically recall, you’ve likely seen it on calendars or in books. It’s one of those iconic scenes I felt compelled to photograph. I must not be the only one, these folks have had to install a big electronically controlled gate to block their driveway. That’s not a country road in the photo, it’s their private drive. The timing seemed fortunate, as a carpet of red/orange leaves made for a nice foreground. This is a photograph that’s been done to death, but not by me, so I enjoyed shooting it anyway. After the trophy shot was in the bag, I tried to find another way to shoot the farm (from the public road) that would be more original. That was only partially successful I guess, there’s a reason everybody shoots it from the driveway…it looks darn good lol. That barn is really super attractive, and as usual if I had more time, or was able to actually get closer there might have been more success. Below is my favorite alternate view. 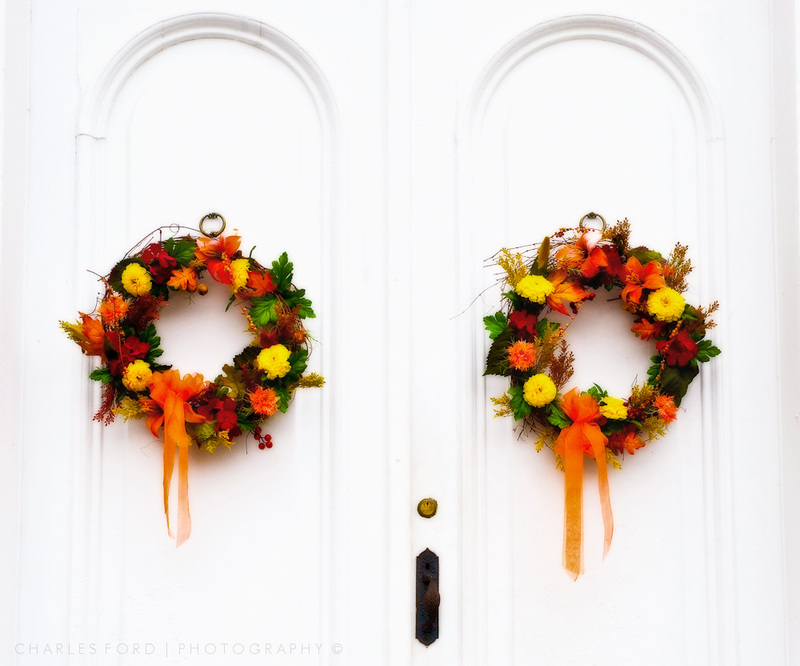 Seeing these again really makes me want to go back to New England in the fall. The response to yesterday’s miracle post, which got me “Freshly Pressed” (thanks WordPress!) was a bit overwhelming. I’d like to thank everyone who took the time out of their day to take a look, and especially those who left comments. Sprinkled throughout the commentary were a few opinions that the HDR on yesterday’s image was overdone, or too saturated etc. I understand. While the general public seemed to like what they saw, HDR can make the more serious photographer’s noses turn up, especially when it is perceived to be overdone. I get it, and that is an entirely valid point of view. For those purists who wanted to see a more normal looking view of yesterdays scene, today I offer a .jpg practically right out of the camera. This is the same hillside and lake from yesterday’s post. The dynamic range of the whole scene from yesterday’s image was way beyond anything the camera could handle in one exposure, the correct exposure on the trees resulted in a totally blown out sky (and the sky’s reflection in the foreground). The only way to have created yesterday’s image was either with HDR, or some major filter work with a neutral density grad. That would have been especially problematic due to the fact that it was not just the sky needing tamed, but the sky’s reflection in the foreground. If there are any skilled landscape photographers out there reading this, maybe you have an alternative, I’d be interested in learning. In a future post I may illustrate what I’m trying to convey here by posting the 3 original exposures I used to create the HDR I will probably do that if I sense anyone is interested in ‘how the sausage is made’ so to speak. Thanks again to wordpress for finding yesterday’s post as worthy, and to all of you for visiting. Sometimes you get lucky. My wife and I were driving from Acadia National Park on the Maine coast to Woodstock, Vermont. I had researched the heck out of both those locations, but didn’t know much about what lay between. We were very tired, on a seemingly endless secondary highway winding it’s way generally westward. This was a remote area, towns and businesses were few and far between. Eventually it became clear that a….ummm…..’rest stop’ was needed. I parked on the highway shoulder as safely as possible, walked about 20 feet from the car, and there it was….a mirror smooth lake reflecting a hillside of spectacular fall foliage. I set up the tripod and shot a few bracketed sets of exposures, one set of which was combined using Photomatix software into the HDR image above. Google Earth provided me with the name of the lake – Lower Baker Pond. Sometimes you get lucky, just make sure you have your camera ready.